The trailer shows Miles Morales as Spider-Man, who is voiced by Shameik More (Dope, The Get Down), as he swings around New York City, chasing some bad guys and stops to see the grave of Peter Parker. The end of the trailer has Spider-Man landing on a roof-top and underneath the mask is Miles Morales. Miles Morales, is a popular iteration of Spider-Man that was first introduced in Ultimate Fallout #4 back in August 2011. Just like Peter Parker, Miles was also bitten by a radioactive spider and gained superpowers and eventually become Spider-Man after Peter Parker is killed by Green Goblin. 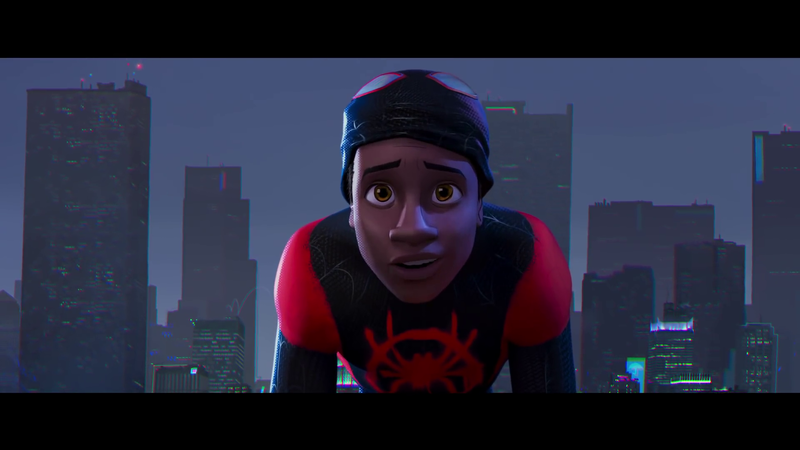 Spider-Man: Into the Spider-Verse is the first big screen debut of Mile Morales and a direct adaptation of the Spider-Verse comic book storyline. The film is written by Phil Lord and Christopher Miller (The Lego Movie, 21 & 22 Jump Street, Cloudy with a Chance of Meatballs), and story by Lord & Miller and Alex Hirsch (Gravity Falls). The film is being produced by Sony Pictures Animation and Marvel Entertainment. It’s being directed by Bob Pershichetti (who has previously worked as the head of story for The Little Prince) and Peter Ramsey (who previously directed 2012’s Rise of the Guardians). It’s important to note that Spider-Man: Into the Spider-Verse is not part of the Marvel Cinematic Universe. The film also stars Mahershala Ali (Moonlight, Luke Cage) as Aaron Davis who is Miles’ uncle, Brian Tyree Henry (Atlanta) as Jefferson Davis, Miles’ dad and Liev Schreiber (Ray Donovan) as the film’s villain. Spider-Man: Into the Spider-Verse will release on December 14th, 2018.